Summertime means popsicles, so let's see what's in the freezer. 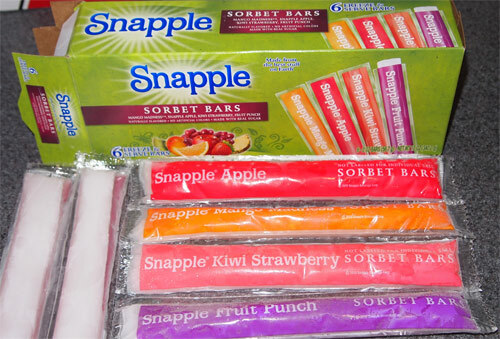 6 pack of Snapple Sorbet Bars. Now I've never seen these before, and the box is copyright 2013, but the bars are copyright 2010... ok, here's a 2010 review from gather, so they definitely aren't new. It looks like you can get these as a ten pack from dollar tree, but this 6 pack came from... a place I cant remember at the moment. It includes (2) apple, (2) kiwi strawberry, (1) fruit punch, and (1) mango madness. I don't know if every box is the same or if they vary. Now the first one I tried was apple, because, well, I can be boring like that. The awesome thing was that it tasted just like a frozen apple. It is spot on for flavor. Oh sure it's a little weird slurping on a colorless treat, but were talking naturally flavored, no artificial colors, and real sugar. Now I had had hoped to try the fruit punch next, but we'll just have to take my wife's word that it was excellent as well. My third choice is the kiwi strawberry which is good, just like the other two. There's just nothing funny going on here. No gumminess, or artificial funk, or anything. Ok, if you want to get technical, these aren't made with fruit juice per say, but at 50 calories a pop and with good flavoring, I can't complain. I thought these might just be a gimmick, but they actually tried here. I mean, even the mango madness one is good. That's such a cool idea for an ice pop! I usually stay away from that end of the frozen aisle because they tend to be sugary and tasteless!